« iPhone Black Friday Deals? 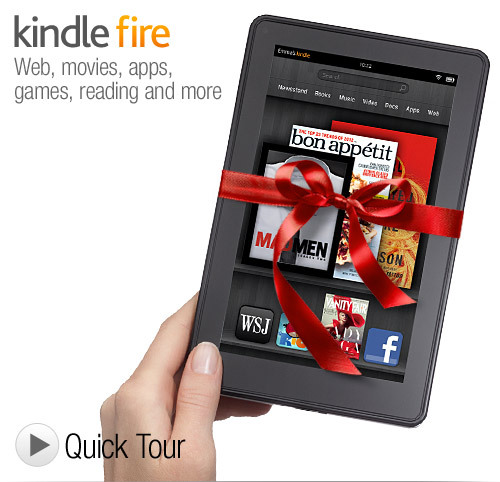 Amazon Black Friday Deals For Kindle Fire Today? Since all of the different Kindles are going at such low prices, it leaves room for accessories. Staples is offering a $15 gift card with the purchase of a Kindle, but Amazon has the widest selection of games, covers and lights for the e-reader. In addition to all of these goodies, there are more opportunities than ever to get free or discounted books. Amazon introduced Kindle Public Library Lending earlier this fall, and it has really taken off. It is currently available in 11,000 and counting libraries nationwide. Other e-readers such as the Nook have been compatible with e-books for awhile. By allowing books to be checked out on the Kindle, e-book borrowing is now available to a much greater audience since the Kindle is the bestselling e-reader. There are also a number of free and reduced priced books available year round. The free book list often carries a well known book for a limited time. Amazon has also added some features that make it worthwhile to be a Prime member. For $79 a year, Prime members can get access to free instant streaming, check out one book a month in the Kindle Owner’s Library Lending program, and enjoy free two day shipping on all products. The Kindle Fire comes with a free month of Amazon Prime, as it makes use of many of the benefits that prime members can take advantage of. The Fire also has a ton of free and inexpensive games and tools to download. Amazon runs sales on Kindle games from time to time, and Black Friday is a good time to do one. In October, there was a .99 sale going on for Halloween editions of Kindle games, so the same deal is expected for editions with themes surrounding the holidays coming up. So, overall, there are a lot of perks to having a Kindle in addition to the low prices on the device itself. Black Friday and the sales around the holidays is a great opportunity to snag the best deals on Kindles, accessories, books, and games.